It's a backward town—and it's hiding a terrible secret. When Stephen's dad says they're moving, Stephen knows it's pointless to argue. They're broke from paying Mom's hospital bills, and now the only option left is to live with Stephen's grandmother, a woman as bitter and stuck as the town of Spencer itself. Stephen's summer starts looking up when he meets punk girl Cara and her charismatic twin brother, Devon. The twins have family problems of their own and aren't exactly close, but Stephen is drawn to them, each for different reasons. With Cara, he feels safe and understood—and yeah, okay, she's totally hot. In Devon and his group, he sees a chance at making real friends. Only, as the summer presses on, and harmless nights hanging out in the cemetery take a darker turn, Stephen starts to suspect that Devon is less a friend than a leader. And he might be leading them to a very sinister end. 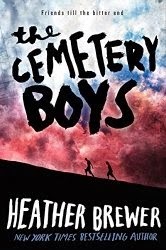 I love new-kid-in-creepy-town tales so I was eager to see what Brewer would bring with THE CEMETERY BOYS. But it quickly became obvious to me that it was going to be a bit of a rif on The Lost Boys but without vampires. It has that same broody peer pressure feel paired with a love interest and that doesn't make it bad, just familiar. Unfortunately, if you've enjoyed lots of dark reads or grew up watching 80's and 90's horror flicks it's going to be really predictable. I enjoyed some of it but felt the punches coming long before they were thrown. In an age of cell phones and the internet it also felt quite dated. If you're an adult feeling nostalgic or just a teen looking for a lazy weekend read it's worth picking up, just don't expect anything relevatory.